1 February, 2014: Syndicate Bank, one of the oldest banks of India, has contributed one meal distribution vehicle to The Akshaya Patra Foundation, the world’s largest NGO run school meal program which currently feeds over 1.3 million children across the country every day. Shri Sudhir Kumar Jain, Chairman along with Executive Directors Shri M. Anjaneya Prasad & Shri T. K. Srivastava& other top officials of Syndicate Bank flagged off the mid day meal vehicle in the presence of Shri. Madhu Pandit Dasa, Chairman, The Akshaya Patra Foundation. 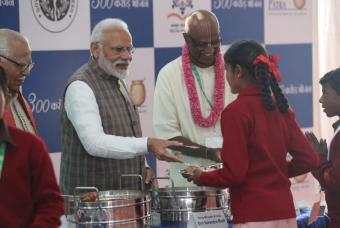 The inauguration was followed by a visit to the Akshaya Patra kitchen to understand the process that caters the needs of millions of children on each school working day. The custom-designed vehicle is insulated to maintain optimal temperature, is dust-free and helps to retain the freshness of the meals. The meal delivery vehicle will help transport hot, nutritious meals from the centralized kitchens to about 4,000 children daily in 40 schools each day. Speaking on this occasion, Shri Madhu Pandit Dasa, Chairman, The Akshaya Patra Foundation, said, “We are thankful to Syndicate Bank for their generous support & to reach out to us and share our vision.” Shri Sudhir Kumar Jain,Chairman, Syndicate Bank said on the occassion, "The Blue buses at Akshaya Patra not only carry freshly cooked nutritious meal for 1.3 million children across India, but also the smile & hope for children to get good food. We are extremely humbled & happy to continue our support to the Akshaya Patra Foundation." Syndicate Bank is one of the oldest and major commercial banks of India. It was founded by T M A Pai, Upendra Pai and Vaman Kudva. The Bank has been operating as a catalyst of development across the country with particular reference to the common man at the individual level and in rural/semi urban centres at the area level.